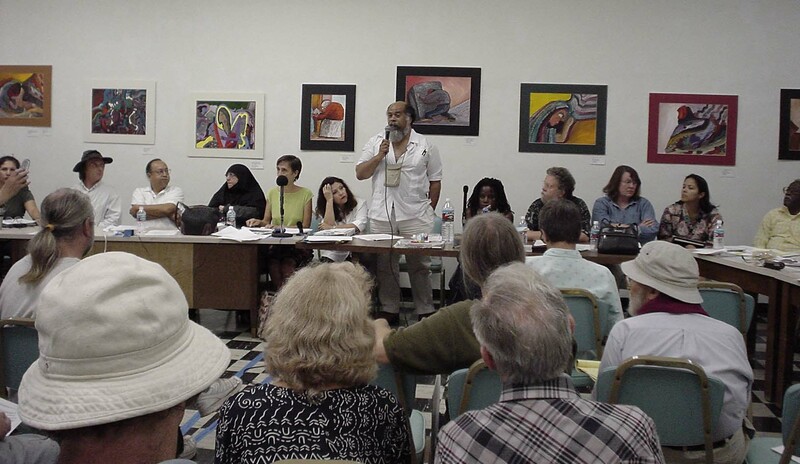 The Local Advisory Board (LAB) of Los Angeles Pacifica Network Radio Station KPFK (90.7 FM) met Monday evening and voted against endorsing draft "B" of Pacifica's Proposed Bylaws. Pacifica has been in a state of creative upheaval ever since a court settlement was reached in December of 2001 requiring the network to create new bylaws that define a process whereby its governing boards will be elected by its listener-supporters. Pacifica is the nation's only non-corporate, listener-funded radio network (NPR is actually a subscription service and receives a large part of its budget from corporations). 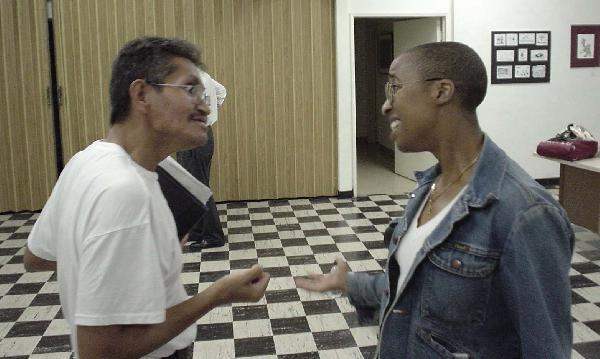 The Pacifica Foundation is a private non-profit corporation that holds and manages the licenses of the network's five radio stations, located in Berkeley, CA (KPFA), NY City (WBAI), Washington, D.C. (WPFW), Houston, TX (KPFT) and Los Angeles (KPFK). Together, these licenses have a commercial value of hundreds of millions of dollars. But of far greater significance is the fact that Pacifica's stations are the most important source of broadcast news and public affairs programming that remains untainted by corporate influence. 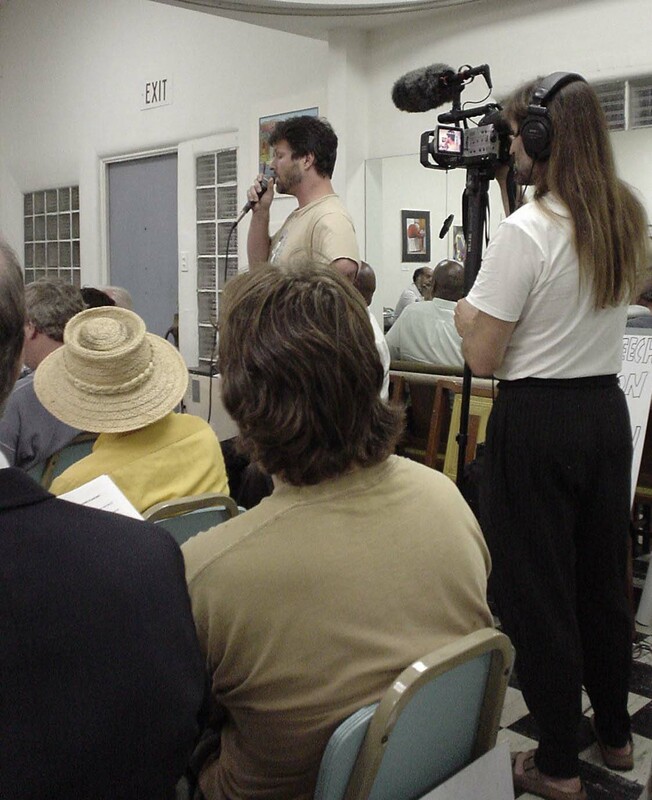 Programs funded and/or produced by the network appear on numerous affiliate community stations throughout the nation, as well, increasing Pacifica's importance. 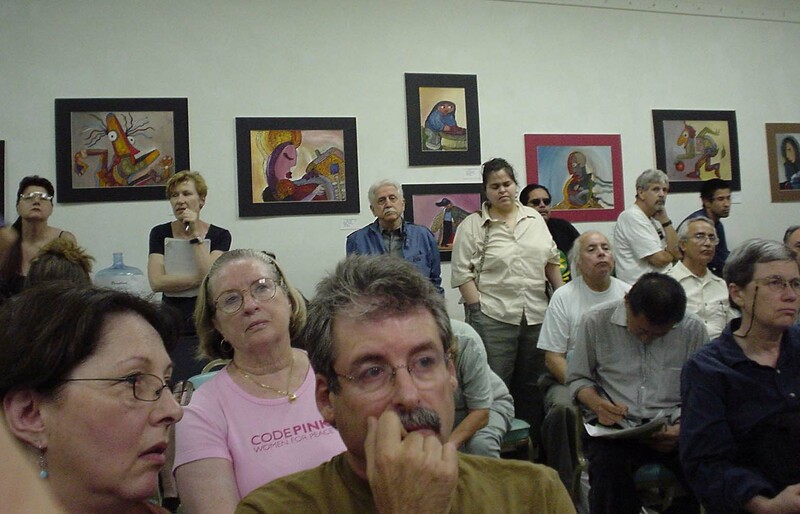 Pacifica's former (pre legal settlement) national board was in the process of making changes to the programming of Pacifica that were intended to mainstream its content. Plans were also being made for the possible sale of one or more Pacifica stations. That is what sparked a set of lawsuits - first by the five local advisory boards (LABs), and then on behalf of the listeners themselves. 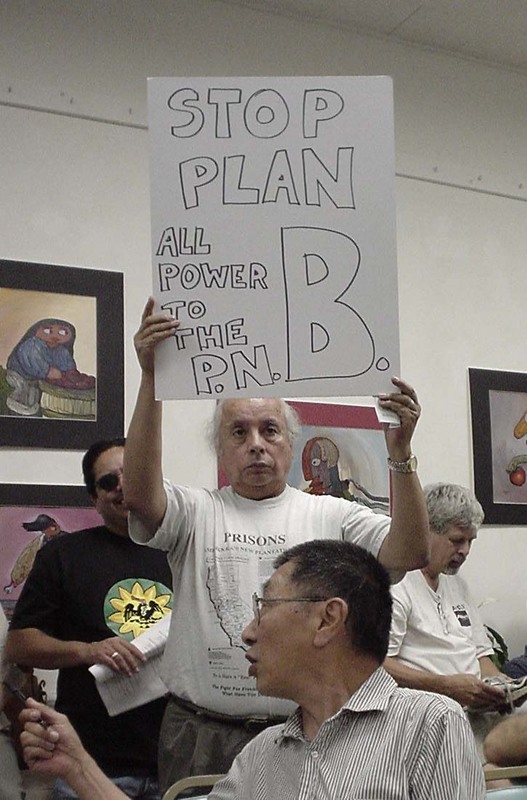 These lawsuits were ultimately successful in forcing a legal settlement agreement that established an interim Pacifica National Board (iPNB), on which representatives of the old (defendant) Board had five seats, the plaintiffs had five seats, and representatives of the LABs (who mainly were aligned with plaintiffs) had five seats. A process was defined whereby new bylaws would be written, by the iPNB with input from the LABS, for the corporation. These bylaws were to include a process whereby local station boards (LSBs) would be elected by listener-supporters and staff members, and whereby the national board would be elected (in most models by the elected LSBs). The agreement requires that these bylaws be approved by 2/3 of the members of the iPNB, and that election-related portions be approved by three of the five present LABs. 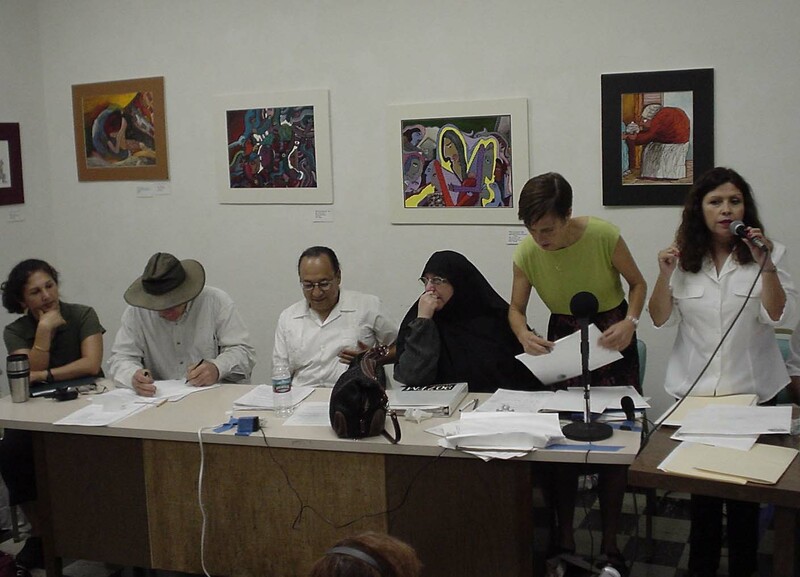 The vote taken by the KPFK LAB Monday night (7/21/03) was an up or down vote on a specific bylaws draft, known as draft "B." Draft "B" included many features that were objectionable to members of the KPFK LAB and to KPFK's listener community. Even those who spoke in favor of its passage almost universally admitted that it had serious problems, but for various reasons (see below) they urged that it be passed nonetheless. -- "B" allows members of the national board (PNB) to appoint three additional members to their own ranks. These additional seats would tend to make even a slim majority undefeatable. -- "B" allows the members of the PNB to vote (by a 3/4 majority) to remove any (listener- or staff-elected) member of a local board. -- "B" allows the members of the PNB and LSBs to amend any bylaws other than those that affect a specific narrowly-defined range of issues without requiring listener approval. -- "B" does not require any minimum amount of on-air coverage of LSB elections, and it further allows present LABs (or later, LSBs) to remain in place until the next schedule election if an election quorum of 10 percent of voters is not met within two weeks of the scheduled close of elections. -- There simply is no language regarding diversity in Draft B that has any binding effect. 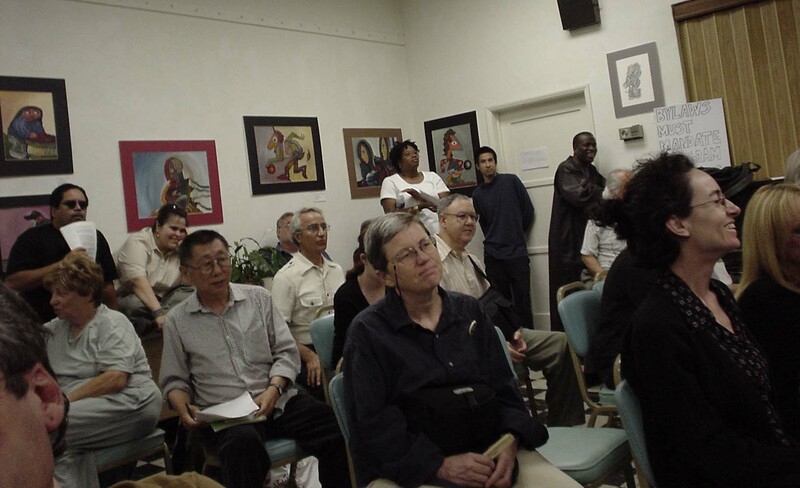 Many listeners support adjustments to electoral results to ensure a minimum amount of diversity on Pacifica's boards. Such provisions are entirely lacking in draft B. -- Draft B centralizes power in the hands of the national board, with LSBs exercising control of various functions only at the sufferance of the PNB. Of particular concern is the centralization of control over programming and over the budgets of local stations. The above is really only a gloss on the problems that exist in draft B (which is about 50 pages long), but it does touch upon some of the major issues. * The bylaws process has dragged on for a very long time (about 18 months) and frankly many people are fatigued by it, and some expressed fears that it could have a damaging effect upon the network. COMMENTS: Yes it has been a long process but if we pass bylaws that compromise democracy and which do not provide any remedies for underrepresented groups, completely apart from the issues of justice involved, we risk throwing Pacifica into years of turmoil, and subject ourselves to the threat of takeover from the inside through centralization of power. Such an attempted takeover was the basis for the lawsuits that were brought against the old Board. * According to the settlement agreement for the lawsuits against the old Board, bylaws were to have been produced by January of this year. Pacifica has already received two extensions from the judge. Some people expressed fears that Pacifica might not get an extension and that the court might impose its own solution or even take us back to Pacifica's original bylaws, which did not include elections. COMMENTS: This judge is deemed by most to be friendly to Pacifica and willing to let us solve our own problems so long as reasonble hope of resolution remains. He also threw out a motion brought by two former members of the old Board to place Pacifica into receivership. * Some expressed a belief that Pacifica could amend its flawed bylaws at a later date using the amendment process defined in draft "B," and that that might be easier than trying to pass good bylaws in the first place. 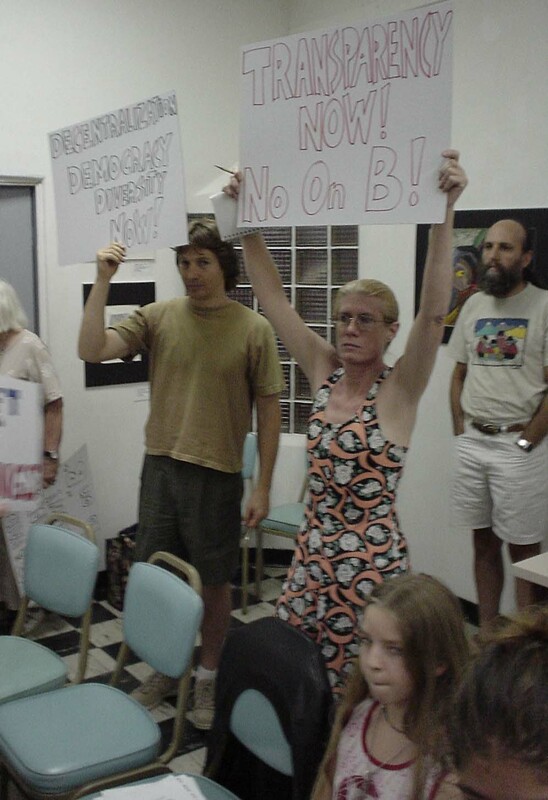 COMMENTS: Under draft "B," every local board seat and every national board seat would be elected during Pacifica's first "transition" elections. As already mentioned, these bylaws do not require any minimum on-air coverage of elections, and allow present LSBs to remain in place if the local election quorum of 10 percent of all eligible listeners is not met. They also allow the *interim* national board to set an arbitrarily short timetable for these initial elections (only). Once Pacifica elects boards by this admittedly bad process, the national board can centralize control over programming and budget, defining the audience that will elect boards during the next elections and using finances as a further tool to consolidate its influence. With the approval of any three LSBs, the national board can, by a majority vote, also amend any bylaws other than those that deal with a narrowly-defined, mostly election-related, set of issues. The proposal of amendments by listener-supporters (as opposed to LSBs and the PNB) is difficult and can be reversed by members of the Boards. This is only a partial picture, but the upshot is that we cannot afford to hold these critical first elections under flawed bylaws, as the game will be over before there is any possibility of amending them..
* There were also those who maintained that there are those on the iPNB and in the LABs who do not want any bylaws at all for reasons that never seemed to be fully described by those making this claim. 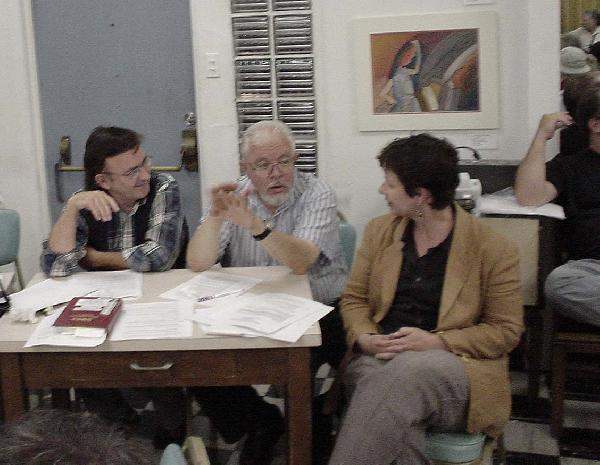 Since two other LABs had already passed draft B, this group saw the KPFK LAB's vote as a unique opportunity that might never come again. COMMENTS: This is an argument that I find particularly upsetting. To understand why, I need to provide some background on how this "unique opportunity" to pass draft B arose. As mentioned earlier, under the settlement agreement, any bylaws must be approved by not only three of the five LABs, but also by 2/3 of those iPNB members "present and voting." Within the iPNB, the major dispute involves the lack of diversity in draft B. 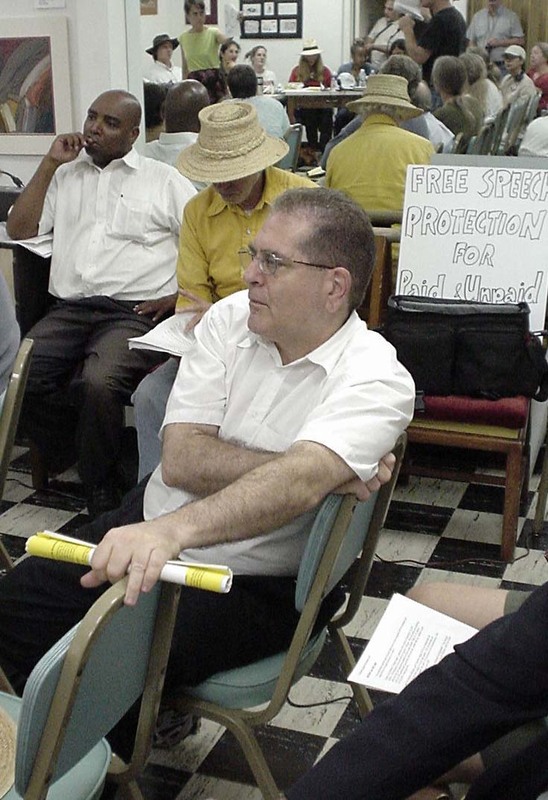 An opposing draft, draft "A," that attempts to provide some adjustments to board composition to ensure diversity, was supported by a minority faction of the iPNB - specifically Ray LaForest and Janice K. Bryant, both persons of color. When the vote on B was taken, there were two other proposals on the table as well: A and C. 12 of the 15 iPNB members were present to vote. 2/3 of 12 is 8, so 8 votes should have been required to pass draft B. But the vote was not presented as a straight up or down vote on B. Instead, iPNB members were asked to choose one of A, B or C. Seven votes were cast for B. Two votes were cast for A. Three members decided to vote not to all three choices. The chair ruled therefore that B had not passed. At this point what *should* have occurred is the iPNB plurality should have negotiated with those concerned about diversity and modified their proposal for a later vote that could gain the required 2/3 approval. But instead of doing that, a group of iPNB members led by Secretary Carol Spooner and fellow lawyer Dave Fertig decided to appeal the vote to the judge to see if they could pass B through the iPNB without the need to negotiate with these two members who were concerned about diversity. Their argument before the judge was that because the vote was presented (inappropriately, in my opinion) as a three-way vote, a vote of no on *all* drafts counted as "not voting." This reduced the number of members deemed to be "present and voting" from 12 to 9, thereby allowing the 7 votes for draft B to count as a 2/3 majority of those "present and voting!" The iPNB chair Leslie Cagan disagreed with this argument, but Fertig took it to the judge presiding over the settlement and the judge certified the passage of draft B, effectively disenfranchising LaForest and Bryant. The judge made a bad decision, in my opinion. The settlement agreement requires 2/3 support by those present and voting for any bylaws change to go through. Nowhere does it allow the results of a three-way vote to be considered as passing amendments to bylaws. In fact, under Spooner and Fertig's reasoning, every single member of the iPNB other than, say, Spooner, could have voted against every single draft, and if Spooner had voted for B, then it would be considered to have passed - *unanimously*. 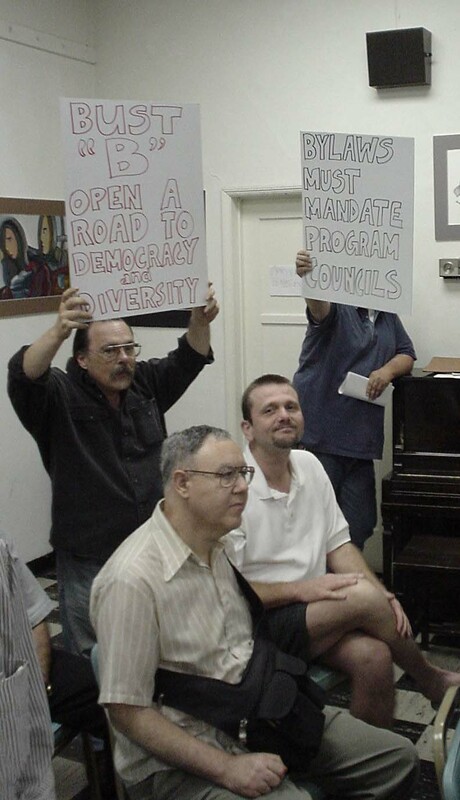 So, this manipulation of a vote that effectively disenfranchised two Board members of color concerned about diversity was the basis for the "unique opportunity" offered last night to the KPFK LAB to pass these defective draft B bylaws. The opportunity was "unique" because it is unlikely that dissident iPNB members would allow themselves to be fooled into a three-way vote again. Perhaps you can see now why I am disgusted by this "we must pass it now or never" claim. The so-called "opportunity" was grounded in the effective disenfranchisement of two people of color whose concerns were about the diversity of Pacifica's boards. There may be other arguments that I have missed and I hope that others reading this will add their contributions. 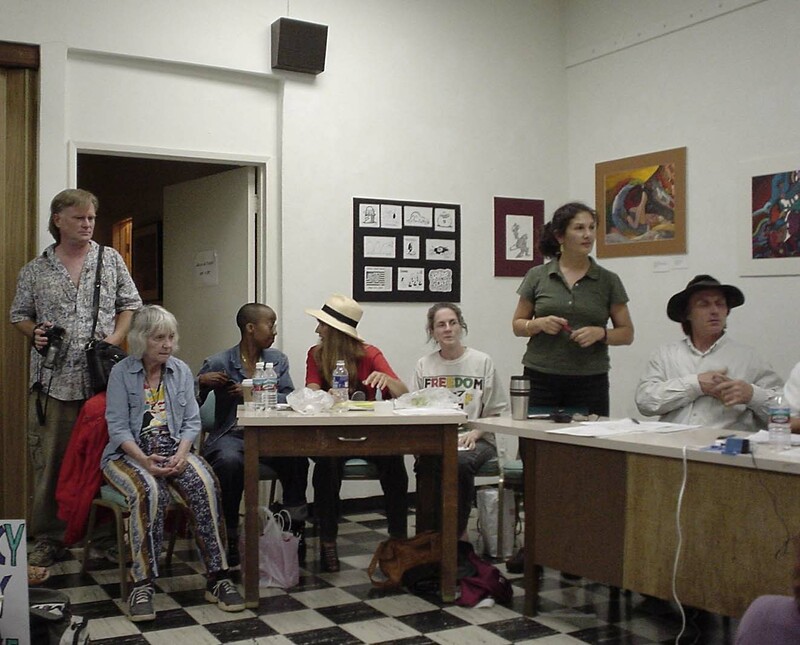 One of the most exciting revelations at the meeting came from KPFK LAB Chair Lydia Brazon. She had decided to change her vote from support of B to opposition. 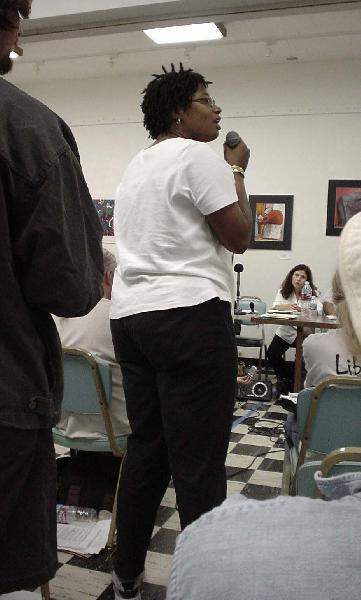 Part of her decision, she said, was based upon a discussion that she had had with Pacifica's own attorney Dan Siegel, in which he had expressed his very strong opinion that Pacifica would not violate any laws and was unlikely to be successfully sued for "discrimination" if Pacifica incorporated strong diversity adjustments into its bylaws. 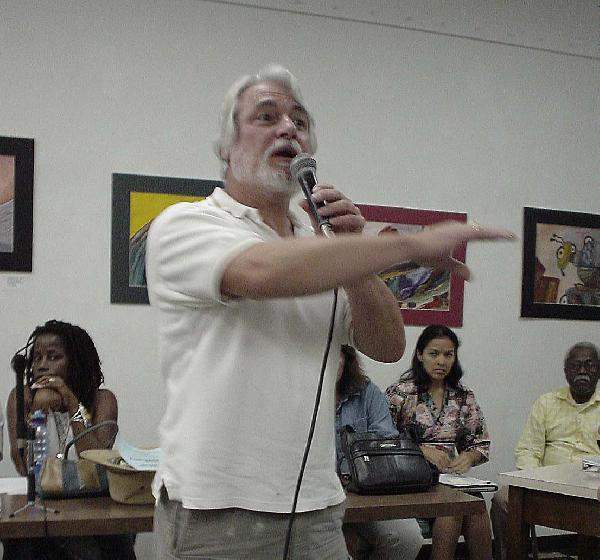 In general, his argument was that a non-profit had never been subject to a lawsuit for requiring diversity on its boards, and that since there is no compensation or other material benefit associated with service on Pacifica's Boards, no person could claim to have been injured by election rules that discriminate based upon race or gender in order to ensure diversity. He also mentioned that Pacifica might lose its Corporation for Public Broadcasting funding if it *failed* to maintain diverse boards. CPB funding has been a matter of great controversy within Pacifica and personally I think we should dump it as soon as we can to avoid the possibility of pressure from that direction. However, the Foundation is still emerging, very successfully, from debt from its recent legal struggle and a decision has not yet been made to give up this funding. The diversity issue has been one of the major sticking points (along with internal democracy and centralization) in the passage of bylaws, and, as Brazon herself commented, we almost certainly could have passed bylaws in January if the diversity issue had been resolved. 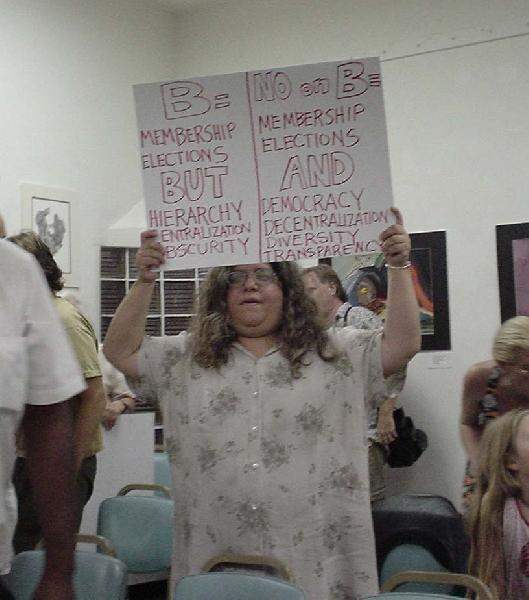 iPNB Secretary and bylaws maven Carol Spooner led the fight to remove electoral diversity adjustments from our bylaws on the grounds that such adjustments were, as she repeatedly asserted, "illegal." She claimed that she was protecting the Foundation from possible lawsuits by keeping such provisions out of our bylaws. It must be said that without Carol's efforts starting several years ago in fighting against the old Board (she filed one of the two major lawsuits that resulted in the settlement agreement), we would not be arguing about election bylaws or diversity today. Still, I am miffed that Pacifica's attorney, who obviously was accessible to the iPNB, apparently either was not consulted or not listened to when Carol decided upon her position on the diversity issue, which she has always claimed was based upon the "illegality" of diversity. After a period of intense LAB and listener debate, draft B was voted down by a slender margin: 11 for B, 12 against B. Another revelation at this meeting was that activists including LAB members and listeners from several signal areas are now hard at work on a new bylaws draft which they believe will remedy the perceived deficiencies of B. It is hoped that agreement can be reached on this, now that some the the legal obstructions to implementing diversity seem to have been removed (although I will not be at all surprised if these claims of "illegality" continue to be made). Nonetheless, many Pacifica activists suspect that Spooner and Fertig may be headed back to court if they do not get the bylaws they want - possibly very soon. If that occurs, it will probably result in a court-ordered mediation process. 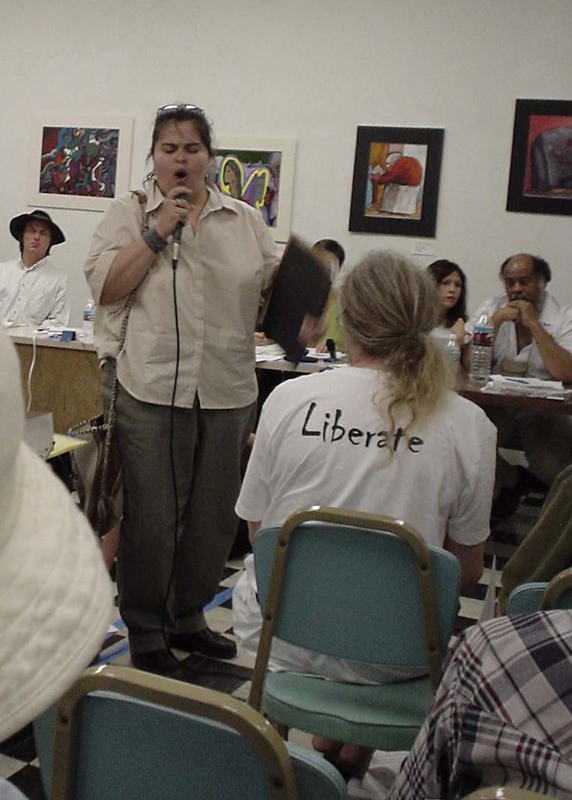 In the meantime, in the midst of all of this travail, our heroic staff is still sending great programming out over KPFK and the other Pacifica stations - Pacifica is still doing its job in this current period of crisis! Stay tuned to your local Pacifica Station! 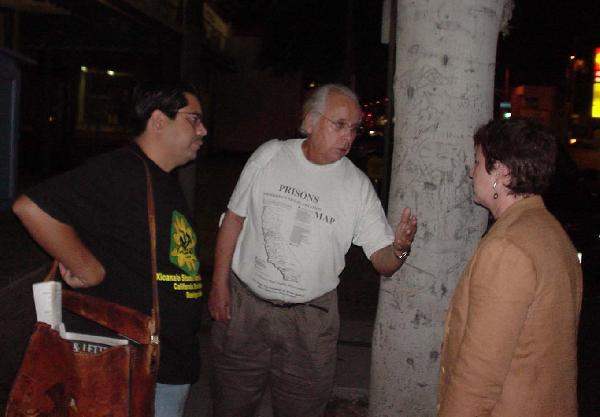 90.7 FM - kpfk.org. 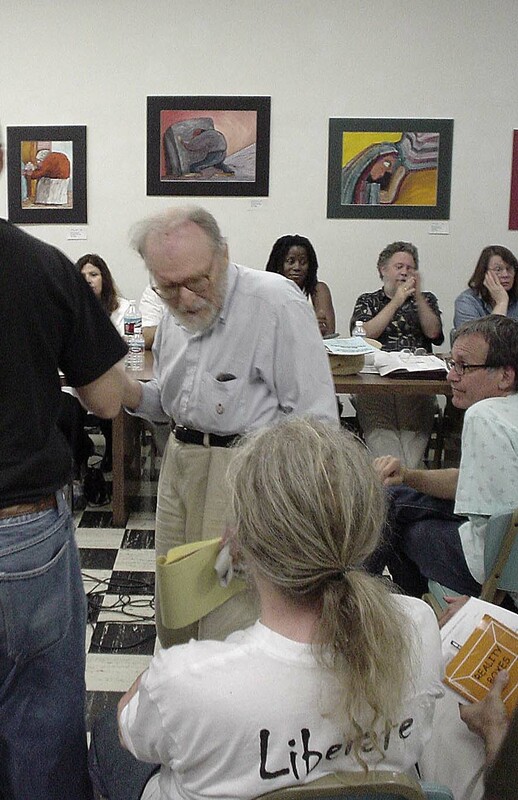 Also, kpft.org, wbai.org, kpfa.orb and wpfw.org. Whatever your position on B, I hope you enjoy the pictures of the KPFK LAB meeting, which appear below. Radford is a leading opponent of Plan B and one of the members working ot draft new bylaws intended to create diverse Boards. Former LAB Chair and present LAB advisor on election issues Dave Adelson provides background on how we can to the point of voting on draft B. Adelson also expressed concern that draft B did not protect staff LSB members from losing their LSB positions due to being fired by management. Left and Right in the following pictures are intended positionally, not politically. Michael Novick, Publisher and Editor of "Turning the Tide" and for decades an activist against racism, attended and spoke against passage of draft B.
I didn't catch his name but he is the third (ever) General Manager of KPFK. He did not speak either for or against draft B.